I stumbled across the “poison panic” by accident, when I was transcribing one of the burial registers for Wix, and have been grimly fascinated by it ever since. I’m very pleased to say that my book, which sprang from this discovery, will be published in 2016 by Pen & Sword. For a few years, Essex was notorious in the minds of the Victorians as a place where women stalked the winding country lanes looking for their next victim to poison. It’s a terrible image – and also one that doesn’t seem to have much basis in truth, but it came at a time of great anxiety. The 1840s were also known as the “hungry 40s”, when crop failures pushed up food prices and there was popular unrest across Europe; the decade culminated in a cholera epidemic in which tens of thousands of people in the British Isles died. At the time, arsenic was easily available, and used for all manner of purposes – to kill rats and mice in the home, as a fungicide for crops and in sheep-dip. It had medicinal purposes, and used in industry – famously, arsenic was used in green dye, used for clothing and furnishings. Sarah Chesham, Mary May and Hannah Southgate were three ordinary women who were caught up in the “poison panic” – all three stood trial, accused of “white powdering”. Were they guilty of murder or were they victims of circumstance? Using newspaper reports, parish registers and censuses, this book considers the cases in detail, but also puts them within their historical context. 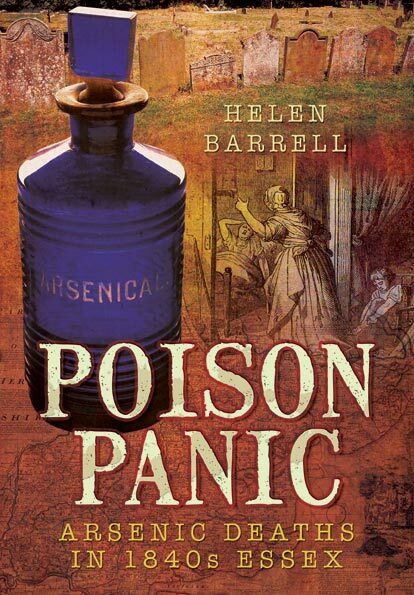 It looks at figures such as toxicologist Alfred Swaine Taylor and eccentric amateur sleuth Reverend George Wilkins, and follows the survivors of the “poison panic” into the second half of the nineteenth century – could they ever escape the taint of arsenic? You can buy a signed copy from me – it’s £14 plus £2.89 P&P (UK 2nd class, or other countries please enquire). Please contact me to arrange payment. UK: Sold by the publisher (Pen & Sword), Waterstones, Foyles, Hive, and Amazon. USA: Sold by Barnes & Noble or Amazon. Available to order from all good bookshops.